When it comes to lifestyle changes, a diet rich in protein, calcium, magnesium, and iodine helps support thyroid function. Iodine is an essential element that assists the thyroid in producing thyroid hormone. By increasing iodine intake, patients have seen an increase in the production of thyroid stimulating hormone (TSH). Although an essential element, too much iodine, such as an overdose of supplements, can have toxic side effects. 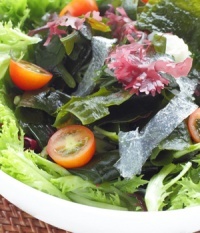 The best natural source of iodine is kelp and other sea vegetables. Containing high amounts of selenium, which is essential to efficient thyroid function and protects from goiter, these foods also contain zinc, iron, and copper--all trace metals vital to thyroid function. Many hypothyroid patients have been found to have deficiencies in trace minerals. These are just a few foods high in antioxidants that help the thyroid gland mitigate oxidative stress.